Supplemented Trip To Paris under Graham Lee finished powerfully to take the glory in the Gold Cup. 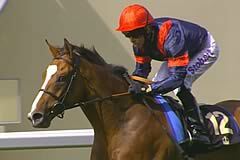 Undrafted, owned by NFL star Wes Welker, wins the Diamond Jubilee Stakes under Frankie Dettori. Ervedya makes it three from three this year as she edges out Found in a thrilling Coronation Stakes. Muhaarar is a second Royal Ascot winner of the week for Charlie Hills as he comes clear to lift the Commonwealth Cup under Dane O'Neill. Free Eagle wins the Prince Of Wales's Stakes in a photo with The Grey Gatsby. Telescope will likely head for a repeat win in the Hardwicke Stakes and could have the Prix de l'Arc de Triomphe as his long-term target following his demolition job at Newbury. Gleneagles becomes only the third horse to win the English 2000 Guineas, the Irish 2000 Guineas and the St James's Palace Stakes. Goldream took the Group One King's Stand Stakes by a short-head, giving trainer Robert Cowell a second winner of the five-furlong race after Prohibit in 2011. French star Solow ground out victory in the Queen Anne Stakes at Royal Ascot. Irish trained sprinters dominated the Diamond Jubilee Stakes at Royal Ascot with Slade Power beating Due Diligence in great style. Telescope streaks clear to win the Hardwicke Stakes at Royal Ascot. A delightful day for Clive Brittain as Rizeena returns to the winners' enclosure. Mark Johnston was on the mark for the second time at Royal Ascot this week when Hartnell took the Queen's Vase. The John Gosden show rolls on as Eagle Top wins the King Edward VII Stakes. Bracelet gives Aidan O'Brien & son Joseph their 1st win of the week taking the Ribblesdale Stakes. The Fugue cruises to victory in the Prince of Wales's Stakes with a track record. Kingman dishes out revenge for his defeat in the 2000 Guineas to take the St James's Palace Stakes from Night Of Thunder. Sole Power defends his title in the King's Stand Stakes in style. Toronado justifies favouritism with victory in the opening race, the Grade1 Queen Anne Stakes. Trends are particularly strong at Royal Ascot, assisted by the fact the best horses all converge for the best meeting. Jamie Spencer partnered York Glory to a clear-cut victory in the Wokingham Stakes at Royal Ascot. Lethal Force ran out a hugely impressive winner of the Diamond Jubilee Stakes at Royal Ascot for trainer Clive Cox and jockey Adam Kirby. Thomas Chippendale lost his life at Royal Ascot after he won the Hardwicke Stakes for trainer Lady Cecil and jockey Johnny Murtagh. Paul Cole's Berkshire ran out a convincing winner of the Chesham Stakes at Royal Ascot. Disclaimer could not provide Warren Place stables with a poignant winner of the Queen's Vase, this year named in honour of the late Sir Henry Cecil, as Leading Light justified 5-4 favouritism. Sky Lantern defied stall 16 of 17 to run out a hugely impressive winner of the Coronation Stakes at Royal Ascot. Ryan Moore produced a fine waiting ride on Hillstar to win the King Edward VII Stakes at Royal Ascot. Kiyoshi trumps the favoured two in the betting market and the Charlie Hills-trained filly could even afford to veer violently across the front of the rest of the field as she approached the finishing post. Estimate raised the roof at Royal Ascot by providing the Queen with victory in the Gold Cup. Riposte provided the Royal Ascot crowd with the win they were all craving for Lady Cecil in the Ribblesdale Stakes. No Nay Never finished strongly to win the Norfolk Stakes in very impressive style for Wesley Ward. Despite missing the break he broke the 2yo 5f track record. Remote lived up to his tall reputation by showing a smart turn of foot to land the Tercentenary Stakes and give John Gosden and William Buick their first winner of the week at Royal Ascot. Veteran handler Clive Brittain won the Queen Mary for the first time as Rizeena blitzed her opponents to give jockey James Doyle a treble on day two of Royal Ascot. Belgian Bill came out of the pack to take victory in the Royal Hunt Cup under a patient ride from James Doyle. Al Kazeem and James Doyle caught Mukhadram on the line to take the Prince of Wales's Stakes in a thrilling finish. Duntle, already a winner at the Royal meeting having landed last year's Sandringham Handicap, landed the Duke of Cambridge Stakes in a thrilling finish. The J P McManus owned and Jonjo O'Neill trained Well Sharp took the Ascot Stakes with considerable ease under Fran Berry. Aidan O'Brien's third string entry blitzed a good field to win the Coventry Stakes at Royal Ascot. Dawn Approach held off a spirited challenge from Toranado to take the St James's Palace stakes by a nose. The American raider Animal Kingdom was left trailing in the wake of most of the field as Declaration Of War fought his way to an impressive victory. Sole Power came with a scorching late run to deny South African challenger Shea Shea on the line to take the King Stand Stakes. Get the best odds on all the runners in the most famous Classic of them all, the Epsom Derby. Previews of every runner, form guide, trends, stats, trial reviews as well as the best free bet offers on the race from leading bookmakers.